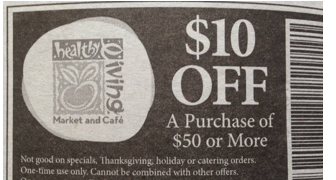 $10/$50 Healthy Living Market Coupon In Today's TU! "We accept one (1) paper competitor “dollars off a category” coupon from other supermarkets and mass retailers (Wal-Mart & Target) in our trade area"
You may want to ask at Customer Service first...I live in Burnt Hills and get these coupons in my paper. I've used them with no problem at the saratoga price chopper, but yet the glenville price chopper won't accept them. Hi. What's the expiration date on this coupon?